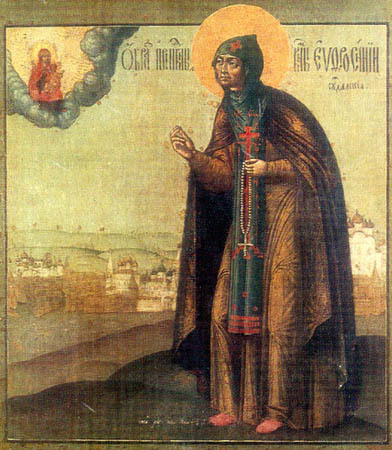 The Nun Evphrosynia, Princess of Suzdal', was born in the year 1212. In holy Baptism she was given the name Theodulia and she was the eldest daughter of the holy Martyr Michael, Great-prince of Chernigov (Comm. 20 September). Noble Prince Michael and his wife Theophania for a long time did not have children and they often visited the Kievo-Pechersk monastery, where they prayed the Lord for the granting of children. Noble Princess Evphrosynia was their first daughter, besought of the Lord in prayer. Three times the MostHoly Mother of God appeared to them and related, that their prayer was heard and that the Lord would grant them a daughter. Theodulia was raised in deep faith and piety. The educated boyar-noble Theodore (Feodor, Comm. 20 September) had a large influence on her upbringing. The diverse education and uncommon beauty of the princess attracted many. The princess was betrothed to holy Nobleborn Prince Theodore (Feodor, + 1233, Comm. 5 June), a brother of Saint Alexander Nevsky, but he died on the very day of his wedding. The princess withdrew to the Suzdal' women's monastery named in honour of the Placing of the Robe of the Mother of God, where she soon accepted tonsure with the name Evphrosynia, in honour of Saint Euphrosynia of Alexandria. As altogether still a young nun she fulfilled the monastic rule of life with an amazing zeal, and she remarkably excelled over the other residents of the monastery in her firmness of reason, spiritual insight and extreme abstinence. The Lord Himself visited the ascetic, commanding her to be vigilant and positive in her efforts. The Nun Evphrosynia to the very end of her life kept to the directives of the Saviour, and overcoming an innumerable number of sly temptations. The extraordinary ascetic life of the Nun Evphrosynia was quickly learned of at Suzdal' and beyond its borders. A multitude of people made visit to the monastery, in order to hearken to the instructions of the Nun Evphrosynia concerning love, prayer, obedience and humility. Often after suchlike talks many accepted the monastic form and began a more zealous service to God. The monastery hegumeness herself had recourse to the counsels of the nun. At the request of the ascetic, the sisters of the monastery were divided into two halves: virgins and widows. This facilitated the spiritual growth and affirming in purity of the sisters of the monastery. After the death of the hegumeness, the Nun Evphrosynia became head of the monastery. In an unique revelation the Lord foretold to the blessed hegumeness about the martyr's death of her natal father, and also about the Mongol-Tatar invasion of Rus'. In the year 1238 vast Tatar-Mongol hordes did actually descend upon the Russian realm. Destroying everything in their path, they came to Suzdal'. The city was completely devastated and burned by them, and only the monastery of the Nun Evphrosynia was spared through her prayers. The Nun Evphrosynia reposed to God on 25 September 1250. At her grave believers continued to receive graced help in the healing of various infirmities. And on 18 September 1698, with the blessing of Patriarch Adrian, the Suzdal' metropolitan Ilarion made the glorification of the Nun Evphrosynia.